Our beautiful breakfast of fresh fruits, croissants, and omelets over, we gathered our things for our river walk. 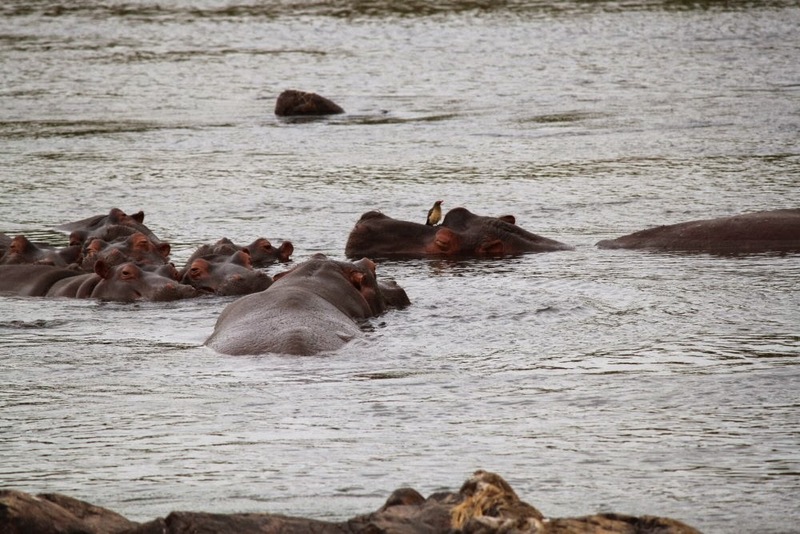 We had already been on safari at 6 AM and now that we were back for breakfast at 9, it was time for a trip to the river. 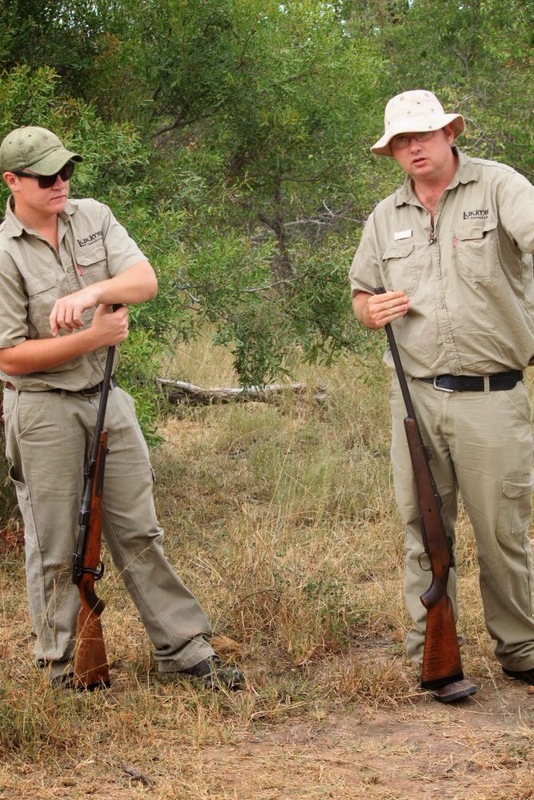 Our guide, Craig, met us at the front of the lodge with the Land Rover and we drove off in the direction of the river. Along the way we slowed to look at impalas and an elephant in the distance. 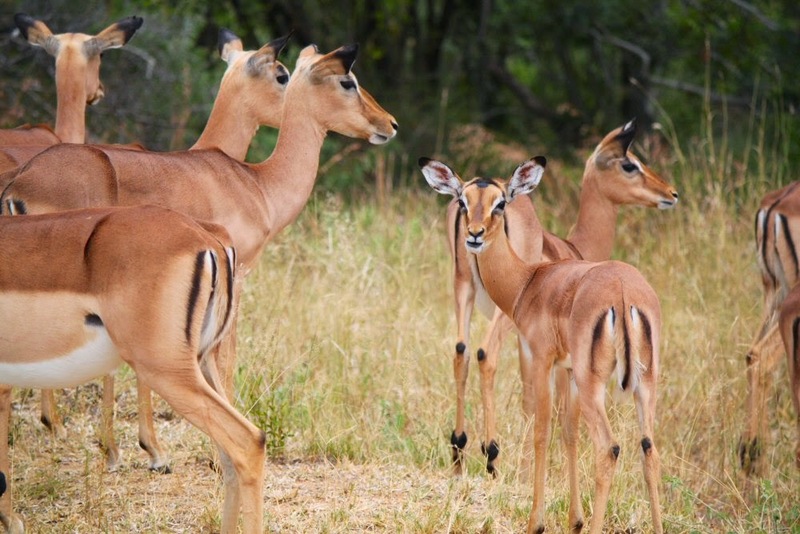 Impalas are especially abundant in the park and we were to encounter lots of herds of them—food on the hoof for the large cats. At the top of the trail that led to the river, our Land Rover met up with another from our group and the two guides hopped out and pulled their rifles out of the cases they were carried in. This was obviously serious business and we paid close attention to the information and direction we were given. 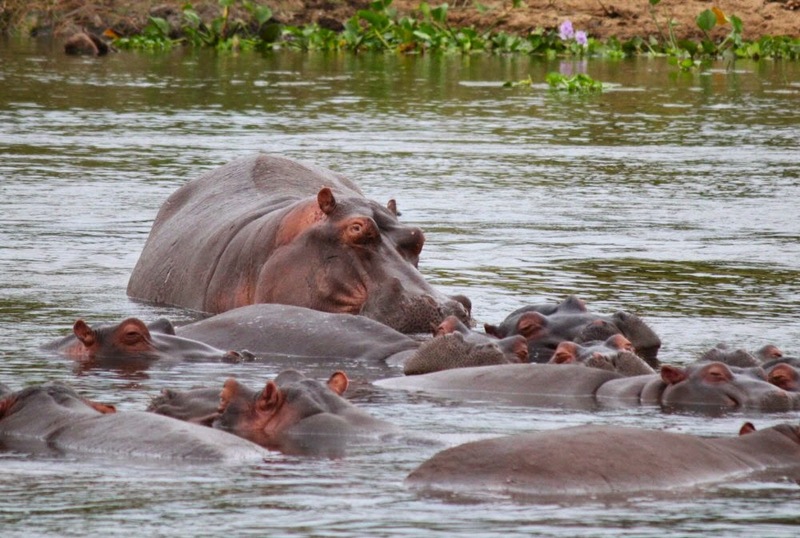 The hippopotamus while not one of the big five actually kills more humans than the other animals. Craig pointed to a wide path on the other side of the river that led down to the water. It was beaten down by the hippos who used it regularly. Our path would not be so easy to navigate. The wide paths however where people actually came to wash clothes in the rivers of Africa were dangerous but attractive to those who were carrying heavy loads of clothes on their heads. People often made the mistake of taking the easy path to the river but at times on their return would come face to face with a hippo. 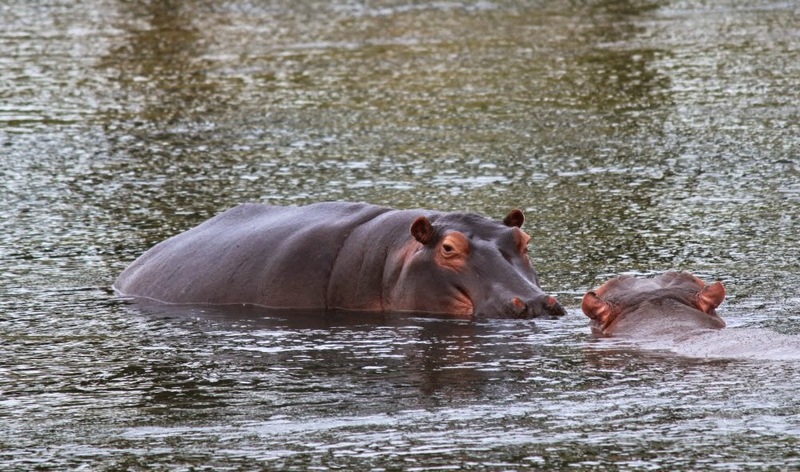 Anything between the hippo and the water makes the hippo very nervous. It feels comfortable in the water and safe so when it encounters something that is in its way, it charges. 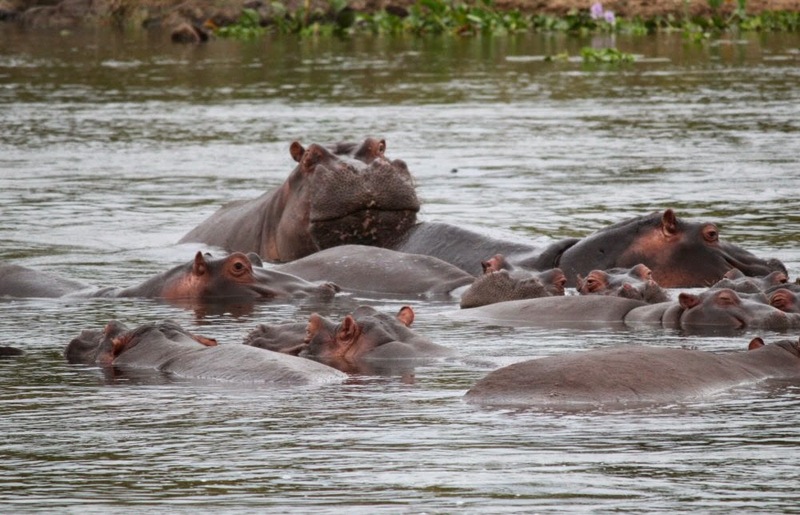 The massive jaws of a hippo can break a person in two. Moral of the story: take the narrow less traveled path to the river. We did. Craig and the other guide cautioned us to be quiet as we walked but once we got to the river, we could talk quietly. One led, his gun resting in the crook of his arm and the other brought up the rear of the group. As we arrived at the river’s edge, I was disappointed. All I saw were huge dark rocks in the middle of the water. And then those rocks began to move and I realized they had ears that twitched and suddenly one surfaced with a snort. It was amazing. (Have I used that word too often?) We watched as a mom and a baby surfaced off and on, the baby coming to the surface a little more frequently since its lungs weren’t as developed yet. Off in the distance we noticed a crocodile slowly making his way toward them. It wasn’t long before mom saw the croc as well and kept positioning herself between it and her baby. The croc gave up. No way was it taking on a huge mama. Craig pointed out that fish were swarming behind the hippos. The animals are vegetarian and when they defecate, the fish get a meal of “fresh” vegetation. I’m not sure what the birds were feeding off of but there were several that kept landing on the backs or heads of the hippos. Again I had that feeling that I was in the middle of a National Geographic movie playing on an IMAX screen. Surreal. After about fifteen minutes we turned around and headed back the way we’d come, up the narrow path and very quietly. 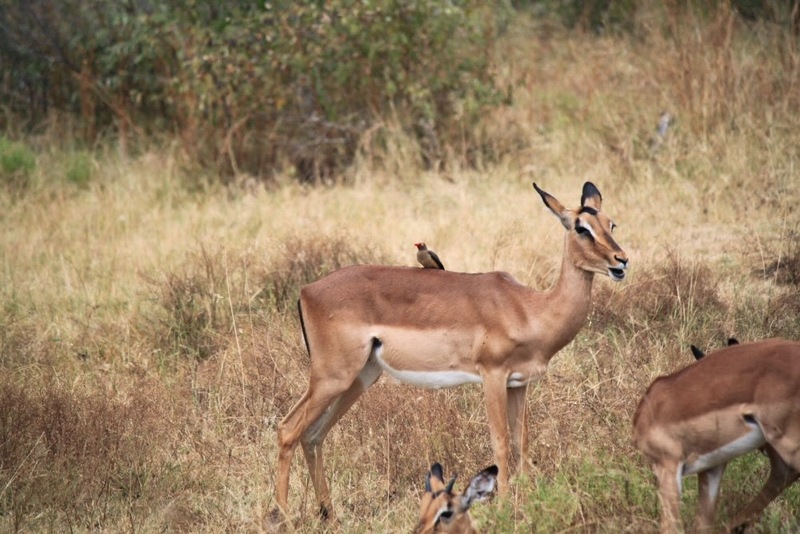 On our drive back to the lodge, we slowed again for more impalas. I laughed. Here I was taking pictures of deer when all I did at home was shoo them out of the yard. Our friends behind us called out, “Not deer. Antelope. It’s okay to take pictures.” We all laughed. Back at the lodge, I took more antihistamine and Tylenol and tried to nap before lunch. It was difficult. 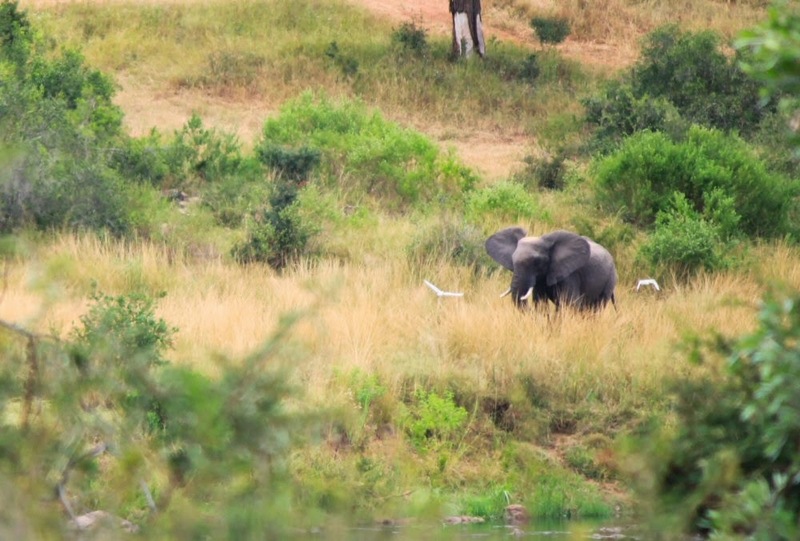 There was too much to process from our morning safari and river walk and the anticipation of another safari at 4 PM set my heart racing—or maybe it was the antihistamine. I blew my nose and closed my eyes again. I’d try.